This is not entirely authentic Amatriciana — for one thing, I don’t usually have guanciale lying around the house, so I use bacon or pancetta when I make this dish. But this is my riff on a simple, classic, budget-friendly pasta dish that you can throw together from fridge and pantry staples in just minutes for a satisfying supper. What’s better than that? 12 oz. pasta of your choice — bucatini is a traditional choice for this, but it’s hardly easy to find. Linguine or spaghetti works just fine! In a large skillet over medium heat, cook the bacon or pancetta in the olive oil until most of the fat is rendered and it’s beginning to crisp. Add the onion and crushed red pepper flakes and cook, stirring occasionally, until the onions are very tender and translucent, about 8 minutes. Add the wine, bring to a simmer, and cook for 3-5 minutes, until most of the liquid is evaporated. Pour in the tomatoes. Season with the salt, pepper, and parsley, and allow the sauce to simmer for an additional 10 minutes to marry the flavors. While you’re working on the sauce, cook the pasta according to package directions and drain. 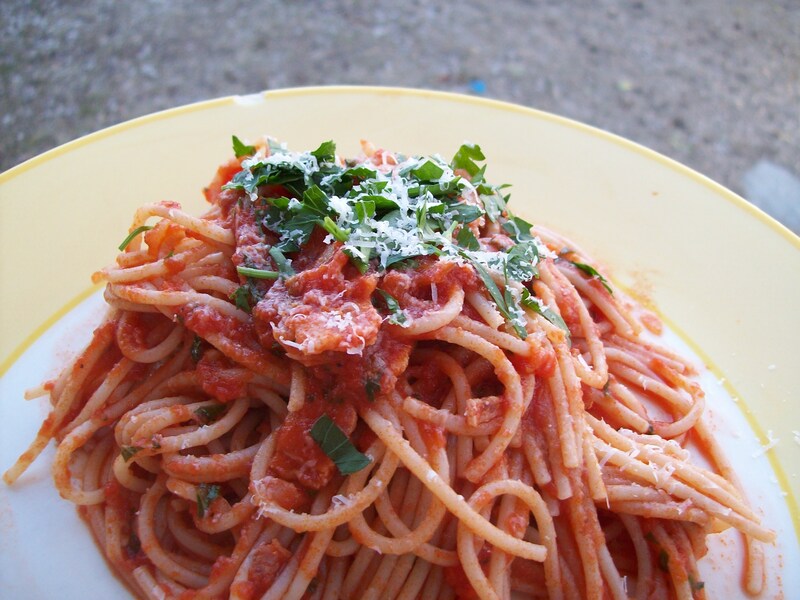 Toss the pasta with the sauce and serve with freshly grated Parmesan or Romano cheese.